I saved the best for last! I absolutely loved this card when I got done with it and that is a rare thing for me as I am usually never totally pleased with a project when I finish it. There were a lot of dies used in this card and it was well worth the time it took to complete. The background was done with the Tim Holtz Bricked embossing folder and I used Coredinations paper so I could sand it lightly and then I used some Colorbox Chalk Ink and lightly went over it. I love how it looks like the outside of a bricked house. The leaves in the flower box are from the Aboscello Tree die and I cut it apart to make the viny looking leaves. The little flowers are from Flower Mound and I used one of my flower shaping tools and pressed down in the center on the foam mat to give them dimension and the centers are dotted with Liquid Pearls. 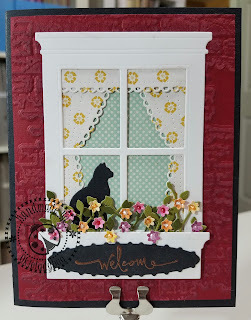 I couldn't figure out what kind of sentiment to use and how to add it but when I started looking through the dies again I found the oval from the Palace Oval Frame Set and it fit on the flower box perfectly. After that it was just a matter of finding a sentiment that fit the card and the oval and I found the "welcome" from one of my Stampin Up sets that worked well. You may have noticed that some of the dies are linked and some are not. A lot of the dies I was gifted are retired and I can't seem to find a place where they can be purchased but if I do find a place then I link it in case anyone would want to purchase the die. I have done this in a couple of previous posts and thought I should explain the reason not all are linked. You guys have a wonderful weekend and Happy Crafting!! Great card Shirley ... WOW, you added so many embellishing elements to it and they all come together perfectly. I love the brick house with it's little kitty sitting so proudly in the curtained window, probably secretly wishing he/she were outside with those beautiful flowers. So like my own cats, although they never go outside (even when the door is open - it's almost like they are afraid of fresh air), they will sit in the window and look longingly at the great outdoors. Love this card Shirley, it strikes a personal note for me. beautiful card. I love the details. What flower making tool do you have? Love this as usual you rocked it, love all the embellishments.